It’s summer where I live, and there’s an abundance of delicious summer fruits. 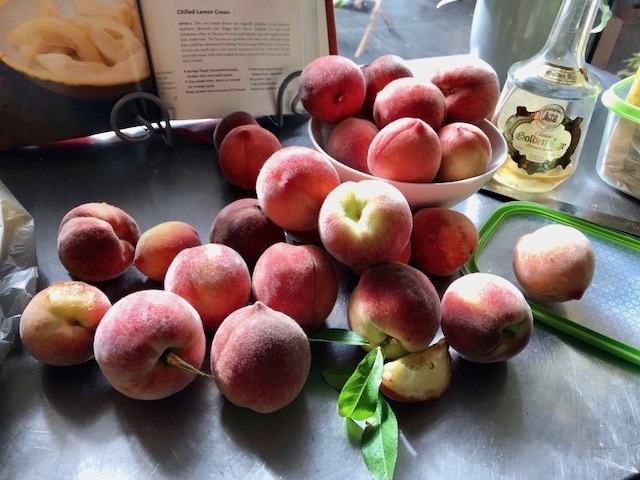 A friend texted me recently to say their peach tree was laden with fruit — more than they could use, and if I wanted any peaches to come around and pick them. So I did. It was a regular summer ritual, and a group event. The whole family would be roped in, my godmother included. Dad and my brother (and later on my older sisters’ boyfriends) would do the picking, and the females would wash, stone or slice and bottle the fruit. And make jam. 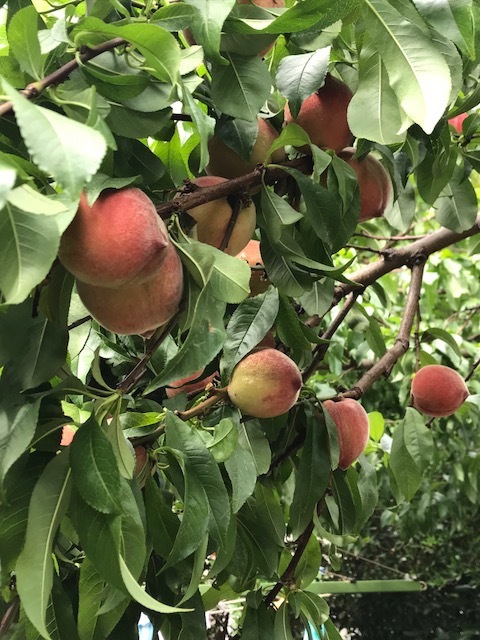 I was always jealous of the guys — I wanted to be outside, up in the tree picking, but being the baby I was in high demand for placing fruit (especially apricot halves) just so in the tall jars — my mother was picky about the arrangement of the fruit and my little hands could reach right down to the bottom of the tall, narrow jars. We bottled and preserved all the excess fruit and vegetables. My parents were living in a “back to the land” style — self sufficiency as far as possible, so we had no electricity, no freezer, water was collected in a tank, and we had hens, geese, a couple of cows and goats and all sorts. And a giant vegie patch as well as lots of fruit trees. My parents were teachers, but they’d grown up on farms, and knew how to grow food. So we did. And nothing was wasted. We left that life when I was four and we moved into a town with electricity and all the mod cons. I remember my fascination with the fridge, the washing machine, ice blocks — ice cream!!!!!! We still had a big vegie patch, and fruit trees, but I missed the animals. If ever I go to the annual Agricultural Show, one of the exhibits I always visit (apart from the animals, the horses and the woodchopping) is the preserving display, where home-bottled fruit in glass bottles is as much about art as edibility and preservation. I remember how hard it was to get the apricot halves arranged just right. And I remember the taste of home bottled apricots which knocks the taste of supermarket apricots in cans right out of the park. But these days I don’t do much preserving, even though I have my mother’s old equipment (somewhere). 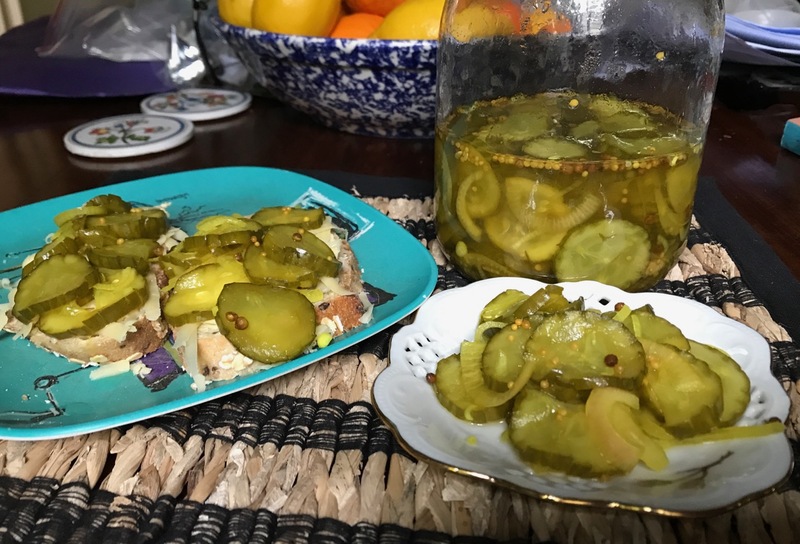 But I did recently make picked cucumbers, and that was easy and delicious, so maybe I’ll get around to expanding my repertoire. I draw on memories of that early life in my books sometimes. I remember the way my mother did the washing, boiling the sheets in a big copper kettle, wringing them out with a wooden wringer and hanging them out on the line. And oh, the smell of sheets dried in the sun. This was long after everyone else had washing machines that did it all for you. She was pretty amazing my mother, living like that, teaching full time and caring for a family of six.